Joe and his mum Lisa had a good night for awards on Monday when Joe received his Gold Chief Scout Award and Lisa received her Wood Badge. The Wood Badge is awarded when a Scouter has completed her or his Scout leadership training and its great to have another fully qualified leader in the group. The Gold Chief Scout Award is the highest award a Scout can achieve and requires a lot of work to complete all the Challenge badges. 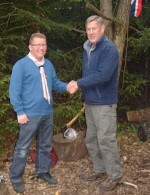 Congratulations to Fraser Sampson who was awarded his Wood Badge by Spencer (GSL) at the May Cub Camp at Runways End. “Wood Badge is a Scouting leadership program and the related award for adult leaders in the programs of Scout associations throughout the world. Wood Badge courses aim to make Scouters better leaders by teaching advanced leadership skills, and by creating a bond and commitment to the Scout movement. Courses generally have a combined classroom and practical outdoors-based phase followed by a Wood Badge ticket, also known as the project phase. 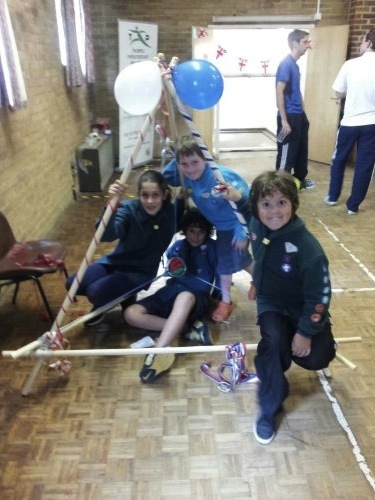 By “working the ticket”, participants put their newly gained experience into practice to attain ticket goals aiding the Scouting movement. The first Wood Badge training was organized by Francis “Skipper” Gidney and lectured at by Robert Baden-Powell and others at Gilwell Park (United Kingdom) in September 1919. Wood Badge training has since spread across the world with international variations. In a bid to go green, as well as save printing costs we would like to send letters out electronically to as many parents as possible. However we appreciate that not everybody checks their email frequently and therefore may miss an important communication. We’ll also be making more use of the website to keep everyone up to date. If you do not have access to emails or the web, please let your section leader know so that they can print notices out for you (or perhaps ask another parent to do it for you). It’s also really important we have the right email for you, so please remember to tell us about any changes.